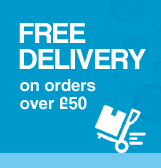 Orders must be placed before 3pm Monday – Friday for Next Working Day Delivery. £17.94 for orders under £50 in value, £14.99 if your total order is more than £50. To arrange a Saturday delivery please call our office on 01473 730520 to place your order with one of our sales team. Our standard shipping charges apply to mainland UK addresses that do not fall into the following zones where shipping charges will be added at checkout based on your location and items ordered. Please note that on rare occasions it may be necessary to contact you regarding the arrangements of your shipping should the combination of your address and order fall out of the services we are able to offer. Please note Aquatix-2u offers a range of delivery services depending on the address we are delivering to, and the weight/size restrictions imposed by each service. Therefore it may not be possible for Aquatix-2u to offer all services to your address. *Next working day delivery (on orders placed before 2pm) is FREE on orders of £50.00 and over for items being delivered to a Mainland UK Address not including the Scottish Highlands, Channel Islands and all postcodes outlined in our surcharge table above. Next working Day delivery is not applicable to certain made to order items (Please note some specialist filters are made to order and may take up to 2 weeks for delivery). Items being despatched via courier will require a signature and operate between 8am and 6pm on weekdays, so please specify an address where someone will be able to sign for your order between these hours. Repeat delivery attempts (more than 2) are chargeable. Please contact Aquatix-2u Ltd if you have not received delivery or received a failed delivery card within 48 hours of dispatch. Items returned to us as ‘unclaimed’ or if the courier is unable to make delivery will be subject to addition shipping costs. Please ensure your delivery details are correct as changes to the address after dispatch may incur additional charges. While every effort will be made to deliver within the time stated, we will not be liable for any loss caused to you by late delivery. Please note that Royal Mail stipulate that only items undelivered after 15 working days can be officially classified as lost. 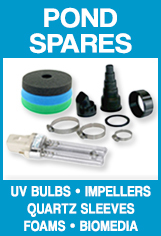 Damages or shortages must be reported to Aquatix-2u Ltd by email or telephone within 24 hours of delivery. If in the rare event any of our products are incomplete or faulty, contact us immediately after receipt. We will of course replace or refund the product as soon as we have determined the best solution for you. In addition, in accordance with the Distance Selling Regulations 2000, you have the right to cancel the order at any time before you receive the goods, and you have the right to return the goods for any reason. If you would like to do this, you (the customer) must send Aquatix-2u notification in writing (by email, or letter) of your intention to do this within 7 working days from the day you received the goods. In these circumstances you as the customer will be responsible for the return shipping costs. The goods are to be returned in their original, unused condition. For your own protection, we recommend goods to be returned (which must be in original packaging & shipping packaging), are sent via a recorded delivery service with sufficient insurance to cover the cost of the goods. A copy of purchase invoice & reason for return must also be included to ensure it can be dealt with both quickly & efficiently upon receipt by our returns dept. If you require Aquatix-2u Ltd to collect unrequired items for return, then Aquatix-2u Ltd will charge for this service. A full refund for the original cost of the goods will be issued within 30 days. Any personalised items or items made to your specification cannot be returned. Items that are perishable also cannot be returned, this includes off the roll liners, hose, books, fish food etc. If you wish to return an item that was part of a combined offer, then all the items may need to be returned together, else you may be charged the full cost of the items you keep. This may include (but is not limited to) items offered free as part of a combined offer. Should the original order value then fall below minimum value for free delivery, our standard p&p charge would then have to be added back on and therefore deducted from refund amount. All our electrical products carry a 12 month guarantee or longer if specified by the manufacturer. Products that carry a manufacturer's guarantee can be returned, if faulty, to us for repair or exchange as necessary during the guarantee period. All products still in guarantee will be tested upon return. Customers residing outside of the UK that have an item repaired or replaced under guarantee will be liable for the postage cost that would exceed the cost in the UK. If a product fails during the first 6 months, Aquatix-2u Ltd will cover the return costs. After 6 months the cost of returning the product lies with the customer. Any failings under guarantee must be reported to Aquatix-2u Ltd prior to return and trouble-shooting advice followed. All returns must be accompanied by proof of purchase and reason for return. Liability will not be accepted for any items returned due to damage, accident, neglect, improper installation or use. Items returned that are not deemed to be faulty or the fault is not covered under the guarantee will be subject to return postage costs. Any item returned other than guarantee claims, must be unused and fully packaged in the original packaging and returned within 7 days of receipt. Any item returned to Aquatix-2u Ltd that is unidentifiable, deemed not faulty (therefore requiring return postage) or requires parts/service charge that is not fulfilled by the purchaser within 3 months from date of arrival or from when latest advice given (whichever is the later date) will be disposed of without further notice.